This is my new favorite food truck. For $8, you get about a cup each of four vegetarian offerings, rice, and naan. They offered to sub one of the vegetable sides for a samosa because I'm a vegan and one of the four sides that day was not vegan. The samosa was amazing, as was the rest of the meal. Will be frequenting this place whenever it's near me or a friend's office. I was over at Metro Center because of an incorrect tweet by the Fajol Bros.saying their Merlindia was there. Wrong truck, and I was in the mood for butter chicken, so I gave India Bytes a try. The butter chicken was meh. The spinach was tasteless green mush. It tasted like plain frozen spinach heated up with zero spices. The lentils, also, meh. I could make better lentils in my sleep. What the food was missing were spices, especially the spinach. Bring your own salt. 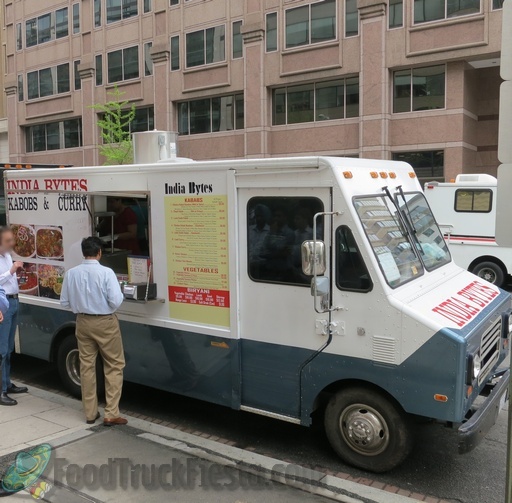 I LOVE Indian food and was excited to try India Bytes last week while on my lunch break. Unfortunately, I had a bad experience and got severe food poisoning after trying their Butter Chicken with Lentils and Spinach for sides. It took about 5 days to recover and hope no one else had this same experience. I'm new to DC coming from Southern California. Living next to Qualcomm there in an area that was heavily Indian I got used to GREAT Indian food for good prices. Lots of trucks and restaurants to chose from. When I moved here I couldn't find ANY good Tikka Masala with good flavor (not bland), with huge chunks of chicken breast and good basmati rice. I know I know..that should be so easy! My daughter despaired of every finding her fave dish. Can I say this stuff rocks! It tasted exactly like we used to have at home - and the veggies were scrumptious (not soggy or bland). Two thumbs up! We'll be following the tweets and will definitely hit this food truck up again! 5 stars! A nice authentic alternative over the Fojool Bros Indian truck. Veggie platter had four heaping scoops... spinach, chickpeas, lentils, and mixed veg all over rice. Naan included. Spiced very nicely. And all for $8. Same thing from Fojool would have cost $11. This is a nice, decent value and my new go-to for curb-side Indian. I just hope they don't raise the prices. Rubber chicken, gritty bland sauce, over low quality rice. The spinach was of a disgusting consistency and was too salty. The mix veg included something unidentifiable that basically had a dried out husk around it, and otherwise contained low quality mixed vegetables of green beans, carrots and yellow corn - no cauliflower. The naan was at least wrapped in foil, but was not cooked properly and had lumps of undercooked dough in it. Butter chicken is awesome, not too spicy, a little sweet, creamy... The owner is VERY accommodating and friendly. Great job and great truck! India Bytes serves Indian cuisine. They actually deleted their Twitter account after several months of operation. The truck appears to have new owners. They do not announce serving locations, so it is impossible to find out where they will be serving on any given day – it’s a surprise!